Dunkeld Cathedral lies on the north bank of the River Tay just to the west of the centre of Dunkeld. It is approached on foot through the narrow streets of Dunkeld which lead you to the Cathedral's ornate gates. With the river on one side and open land leading to hills on the other, the setting is idyllic. To the west are the extensive grounds of the Hilton Dunkeld House Hotel. The site has been holy ground since about 730AD when Celtic missionaries built the first monastery here. The major development came in 848, when Kenneth MacAlpin, by then King of the Scots and of the Picts, rebuilt the original wattle buildings in red stone (see our Historical Timeline). 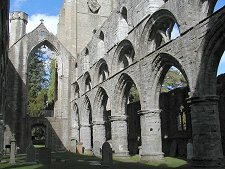 Two years later Dunkeld became the religious centre of Scotland when the relics of St Columba were moved here from Iona in the face of increasing Viking attacks on the west coast. The Cathedral you see today shows both Gothic and Norman influence having being built in stages over a period of nearly 250 years between 1260 and 1501. 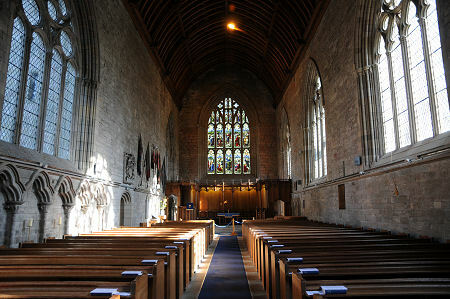 The restored choir is the oldest part or the original church, having been completed in 1350. It contains some of the original red stone in its east gable. The Cathedral is dedicated to St Columba. Its said that after their journey from Iona his relics were buried under the chancel steps to keep them safe. The dove motif, symbolic of St Columba's name, can be seen in both the East Window and on the specially woven chancel carpet. 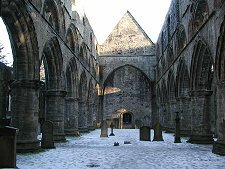 Dunkeld Cathedral twice suffered desecration and destruction during Scotland's turbulent history. In 1560 it suffered badly in the Reformation, and anything considered to be remotely "Popish" was destroyed. 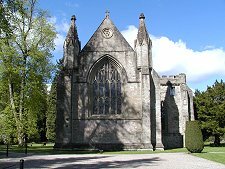 The chancel was repaired and re-roofed in 1600 to serve as Dunkeld's parish church. Worse was to come on 21 August 1689, during the first Jacobite uprising. The Jacobites, fresh from their victory at Killiecrankie to the north, attacked Government forces based in Dunkeld. During the course of a long, bloody and largely inconclusive battle, much of the town, including the repaired parts of the Cathedral, were burned down. The Cathedral has since seen a succession of repairs to the choir, and in 1908 this was restored as nearly as possible to its original form. The impressive Great East Window was added at this time, a gift of the late Sir Donald Currie of Garth and Glen Lyon. It depicts the Christian virtues of Fortitude, Charity, Prudence, Justice, Faith, Hope, Temperance and Patience below which there are five shepherds gazing at the angelic host. In the bottom section is St Columba addressing the people. In the east end of the cathedral is the magnificent tomb of Alexander Stewart, 1st Earl of Buchan, better remembered as the Wolf of Badenoch. The chapter house, under the bell tower at the west end of the Cathedral contains a museum with a graphic display outlining the history of the church and its community from Celtic times to the present day. 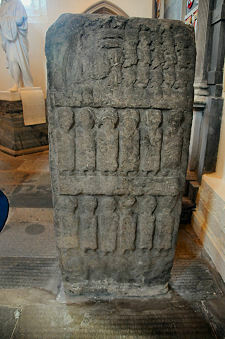 Other interesting exhibits include the Apostles Stone, a fine example of a Pictish stone of the 800s, a Cross Slab of a similar date, the Old Bell, removed during the 1975 restoration, and marble statues of the 4th Duke of Atholl and Sir Donald Currie, the 1908 restoration benefactor. 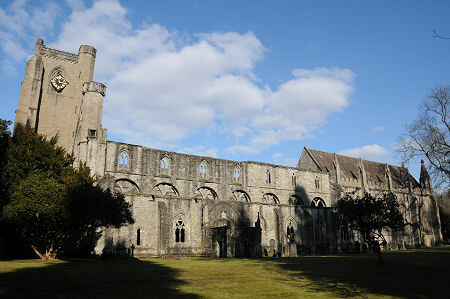 Dunkeld Cathedral is a building of two very distinct halves. Its east end is a rather attractive parish church; its west end, apart from the bell tower and chapter house, a roofless ruin with a grassy carpet. 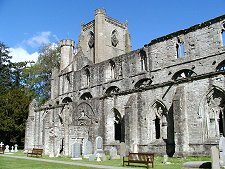 Collectors of cathedrals will note the similarities between Dunkeld and Dunblane Cathedrals, and visits to both provide and interesting opportunity to compare and contrast. For 300 years Dunblane comprised a smaller active church attached to the post-Reformation remains of a larger cathedral; though this changed from 1889 when Dunblane was restored in its entirety.